I am one of those individuals affected little by caffeine. A breakfast of coffee and muffin is nice but if the muffin is enhanced with espresso, that’s even better. I am anticipating a few days away from my kitchen so it was once again crunch time to use up all the perishables. I thought I counted my bananas right when I did weekend grocery shopping but it appeared Costco-fever strike again and I had two extra. That can only mean one thing, banana quickbread time! Of course I love banana bread as much as anyone but it takes an hour of baking time for a regular-size loaf. When the clock is ticking, instant gratification counts. 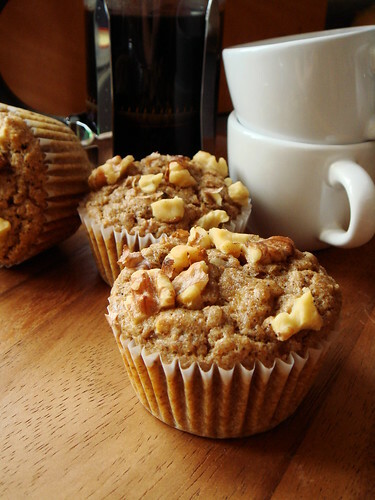 I did a quick search of my cookbook library using Eat Your Books and Heidi Swanson’s (101 Cookbooks) recipe for Espresso Banana Muffin from Super Natural Cooking came up. Did I mention how much I love my library on Eat Your Books? Making all my cookbooks digitally indexed and searchable is possibly one of the best fifty dollars I spent. Instead of gathering dust on the shelf, I get the most use out of my ever-expanding cookbook collection. The batter was quick and easy to put together. Although the recipe instructed to cream the butter and sugar, I opted to make it using the classic quickbread method using melted butter. With 2 teaspoon of baking powder in the recipe, the physical leavening from creaming is not really necessary. I was one banana short of getting 1 1/2 cup of puree so I supplemented with unsweetened apple sauce. Similarly with the yogurt, I used a mixture of Greek yogurt, buttermilk, and sour cream to fulfill the 1 cup requirement. This muffin was very moist and tender the day it was baked. The espresso flavour could have been more assertive but the aroma of was a mouth-watering mix of coffee and baking that fooled me into thinking my kitchen turned into the local cafe. I like the fact that 100% whole wheat flour was used in this recipe with no compromise to the texture. This is definitely a wonderful standby for a decadent breakfast. Who doesn’t want to wake up to the smell of fresh coffee and muffins? This year has been unusual that I baked up so many seasonal treats for Valentine’s Day, a day which chocolate reigns supreme. In fact, all the anticipation leaves me feeling un-Valentine now that the day has finally arrived. To not celebrate, I decided to make something homey and non-chocolaty, something that I would love to eat any other day of the year. Although a multi-component master piece of dessert is technically challenging and intellectually stimulating, I am often drawn to simpler baking recipes that makes me think “I want to bake and eat that”. Unfortunately, being an avid recipe and cookbook consumer, recipes that do not bring something new or intriguing rarely make their way to my to-cook list. Chocolate chip cookies? Pass. Fruit crumble? I can make that in my sleep. Loaf cakes? I’m close to running out of fresh ideas for styling a loaf. True creativity is a rare thing and when I see it, it makes me want to stop everything I’m doing and get to my kitchen right away. Flo Braker’s Baking For All Occasions provides me with many of such moments. I love to play recipe roulette with this book. I simply open a random page of the book and I’ll most likely land on a recipe that makes me appreciate Braker’s creativity. I perked up as soon as I opened the page with the heading Peanut Butter Pound Cake with Coconut Date Topping. 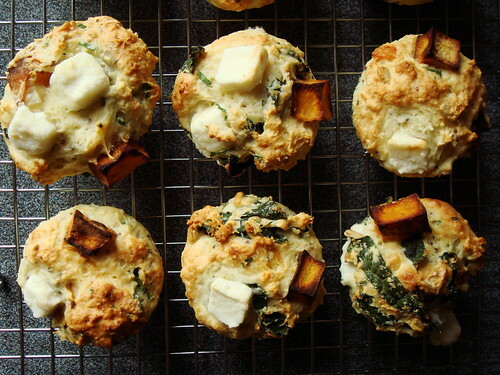 I’ve been thinking about making savoury buckwheat muffins. Even though my last baking experience with buckwheat flour was less than satisfactory, I do like the taste of this alternative flour. Buckwheat flour is often used to make galette (savoury crepe) so my thoughts naturally turn to pairing it with savoury ingredients in a typically sweet baked good. I searched high and low in my cookbook library as well as my favourite online recipe sources. To my surprise, there is awfully few recipes for buckwheat muffin, much less one that is salty rather than sweet. Time to come up with my own version. First of all, I needed a batter base. Buckwheat flour is gluten-free so I want to ensure the batter is balanced to have enough structure. I do not want to play around with substituting portion of wheat flour until I find the sweet spot of good texture without drowning out the buckwheat flavour. I immediately thought of the classic corn muffin. Corn muffin typically uses a large amount of cornmeal, also gluten-free, and has a tender crumb from sour cream or buttermilk. I loosely adapted my favourite corn muffin recipe to create the batter base. I have finally come to the end of my week long March Muffin Madness. 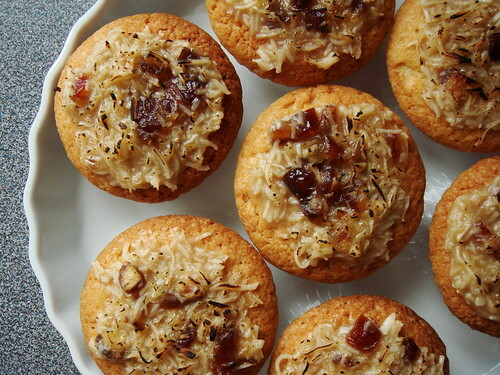 This is a great opportunity for me to try another unusual muffin recipe that I've been eyeing a long time. Regan Daley's In The Sweet Kitchen is one of the first "serious" baking cookbooks I purchased and I have very good results with every recipe I attempted from this book. If you take a closer look at this recipe, you will notice that the only fat element is butter. Most muffin recipe supplements the fat element with a dairy ingredient such as buttermilk, milk, yogurt, or sour cream. This recipe uses a large amount of freshly squeezed orange juice instead. I find that really intriguing. While the muffins are baking in the oven, the fragrance of orange is irresistable. I used some leftover streusel topping from the blueberry muffin on a few of the muffins. It's a good way to use up some of that huge bag of streusel. This muffin is very moist and it's great for people who claim not to like sweets. Preheat oven to 350F. Line muffin pans. In a large mixing bowl, stir together flour, baking powder, salt, sugar, cornmeal, and millet. In a small mixing bowl, mix together eggs, orange zest, orange juice, and butter. Pour wet ingredients into dry ingredients and gently combine. Fold in the dried cranberries. Divide batter to muffin pans. Press streusel toppings on muffin if using. Bake for 25-30min until golden. Makes 18 muffins. 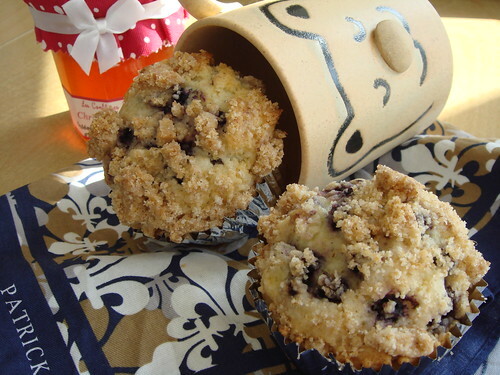 No muffin repertoire is complete without a classic blueberry streusel muffin. I've tried many different recipes before, most claiming that they are the best. It's a personal preference I suppose, but I am not particularly fond of recipes that depend on heavy use of butter to tenderize. When I see a pool of melted butter underneath the baked muffins, I get a little queasy. So far, my favourite recipe comes from Regan Daley's In The Sweet Kitchen except for the fact that it is more labour intensive than most muffin recipes (therefore not a good recipe to attempt before my morning coffee!). One interesting thing I notice, however, is that blueberry muffin is most likely to veer from the classic quick bread method and incorporate a butter cake mixing method instead (depending on mechanical rise from butter and sugar in addition to chemical rise). Perhaps people generally expect a more tender, cake-like texture when they eat blueberry muffins? A few days ago, I purchased a copy of The Best Of America's Test Kitchen: Best Recipes And Reviews 2008. I was attracted by Cook's Illustrated's version of "the best" blueberry muffin. In the past, I've had pretty good experience with the recipes from this source so I am curious to try. It uses the classic quick bread mixing method so if I make the stresel ahead of time, it is convenient enough to be a good alternative for early morning muffin baking. The following recipe is my adaptation. To make the streusel: In a medium mixing bowl, stir together flour, brown sugar, sugar, cinnamon, and salt. Pour in the melted butter and toss with a fork until the mixture forms into pea-size crumb. This recipe makes enough streusel for many batches of muffin. You can store the extra streusel in the freezer for later use. To make the muffin: Preheat oven to 375F. Line a dozen-size muffin pan. In a large mixing bowl, stir together flour, baking powder, and salt. In a medium mixing bowl, whisk together egg, sugar, vanilla extract, and lemon zest until thick and pale. Whisk in buttermilk and then melted butter. Pour the wet ingredients into the dry ingredients. Mix gently until just combined. Fold in the blueberries using as few strokes as possible. Since the berries are very cold, the batter will turn very stiff. Divide batter among the muffin pan. 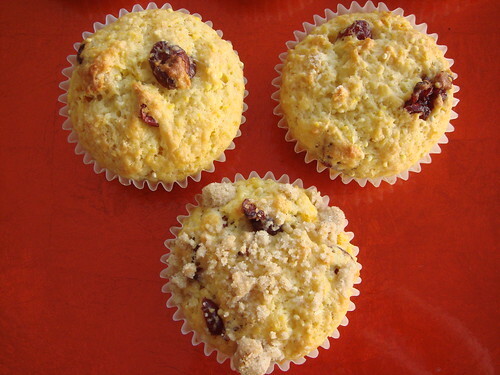 Sprinkle each muffin with a tablespoon of streusel. Lightly pressing the crumbs to the batter. Bake for 25 minutes until golden and cake tester comes out clean. Makes one dozen muffins. Enough with this trying-to-be-healthy attitude! It is now past the half-way mark of my March Muffin Madness and I say let's bring on the decadence. What's more decadent than a rich espresso chocolate muffin studded with chocolate chips? This recipe is adapted from Dorie Greenspan's Chocolate-Chocolate Chunk Muffin from her cookbook Baking: From My Home To Yours. Ms. Greenspan is one of my favourite cookbook authors and her recipes frequently make repeat appearances in my kitchen. I was looking for a chocolate muffin recipe today and was I ever glad to find hers available on the Epicurious recipe database! 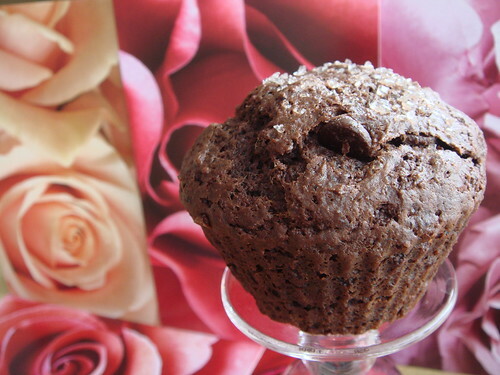 This muffin is rich with deep chocolate flavour and it's only mildly sweet. I especially like the crunch that the sanding sugar topping adds. Preheat oven to 375F. Line a dozen-size muffin pan. In a small mixing bowl, microwave butter and chopped bittersweet chocolate until melted and smooth. In a large mixing bowl, stir together flour, cocoa powder, sugar, espresso, baking powder, baking soda, and salt. In a small mixing bowl, stir together buttermilk, egg, vanilla, and melted chocolate mixture. Pour wet ingredients into the dry ingredients in the large mixing bowl. Stir gently until just combined. Fold in chocolate chips. Divide batter in muffin pan. Sprinkle with coarse sanding sugar. Bake for 20min or until cake tester comes out clean. Makes 15 muffins. I have cornmeal! After three consecutive days of muffins made with some kind of fruit/vegetable puree, it is now good time for a change. 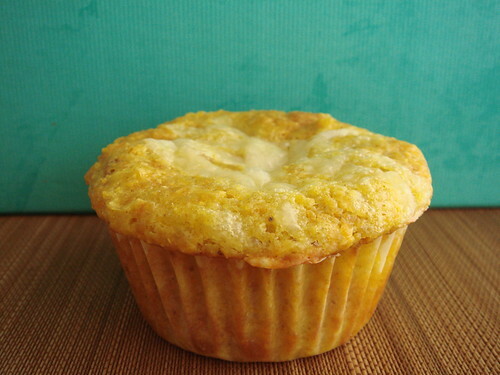 This corn muffin is unmistakeably savory with its combination of curry, cheddar cheese, and bacon. It is an awesome accompaniment to a hearty soup for a light supper. My preferance for cornmeal is stone ground medium grind because it makes a more toothy texture. However, the surprise ingredient for this muffin is canned cream-style corn. I never would have thought of using this! Preheat oven to 375F. Line three half-dozen muffin pans. In a large mixing bowl, stir together flour, cornmeal, baking powder, baking soda, salt, and curry powder. In a medium mixing bowl, stir together eggs, buttermilk, creamed corn, and melted butter. Pour the wet ingredients into the dry ingredient and blend to barely combined. Gently fold in 100g of cheese and bacon. Divide batter among the muffin pans. Sprinkle the remaining cheese on top. Bake for 25 minutes until golden. My original plan was to make corn muffins today from a rather intriguing recipe. I picked up all the missing ingredients after my daily workout and was about to scale out everything. Who would have thought I do not have any cornmeal in my pantry?! So I had to change my plan last minute using some pantry staples for today's muffin. 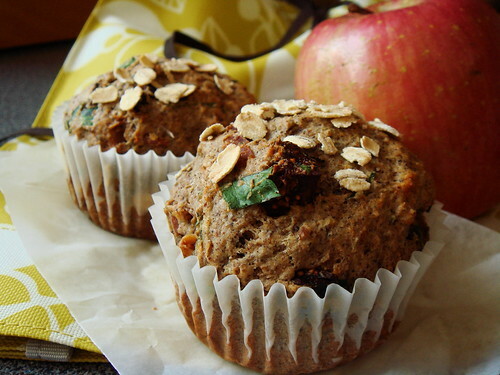 Who can resist the delicious smell of apple and spices from freshly baked goods? This moist muffin is all that and more. The use of ground pecan adds a nutty richness to the tender crumb. The rum-soaked raisins contributes some textural constrast. If you don't have any rum-soaked raisins in your pantry, you can substitute with raisins plumped in hot water for about 10 minutes and drained. If the raisins are not plumped before adding to the batter, it will soak away moisture from the batter. Preheat oven to 400F. Line a dozen-size muffin pan. In a small mixing bowl, combine the ingredients for spiced sugar and set aside. In a large mixing bowl, stir together flour, ground pecan, baking powder, baking soda, spices, and salt. In a medium mixing bowl, stir together butter, applesauce, eggs, and brown sugar until smooth. Gently mix the wet ingredients into the dry ingredients until barely combined. Fold in raisins. Divide batter to the muffin pan. Sprinkle with spiced sugar. Bake for 20min until golden. Makes one dozen muffins. After yesterday's success with banana bran muffin, I decided to host a March Muffin Madness week at Dessert By Candy. Everyday this week, I will bake a different batch of muffins. The fruit of my labour will obviously go to my family and friends...or my freezer if I absolutely cannot find any volunteers! 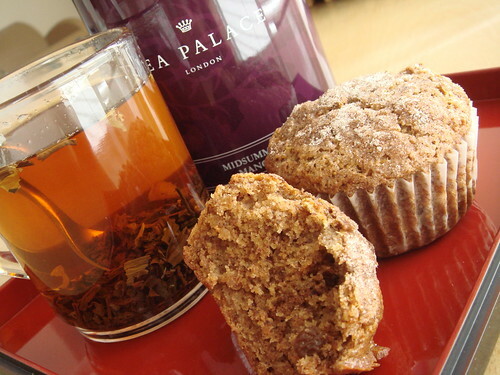 Today's recipe is Pumpkin Date Muffin. 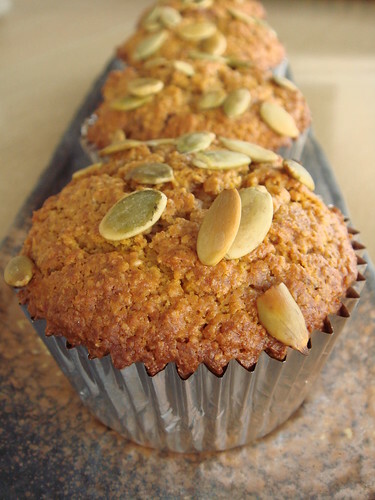 This recipe uses a large amount of pumpkin puree in addition to some healthy ingredients such as oat bran and dates. Due to the use of oat bran, there isn't as much gluten development as a recipe that uses all flour. As a result, these muffins are really tender. The use of molasses and spices may remind you of gingerbread. In any case, my kitchen is smelling so nice! In a small mixing bowl, stir together all the wet ingredients including butter, pumpkin puree, yogurt, eggs, molasses, and vanilla. In a large mixing bowl, stir together all the dry ingredients including flour, oat bran, baking powder, baking soda, salt, sugar, and all the spices. Toss in the chopped dates in the dry mixture until the date pieces separated. Pour the wet mixture into the large mixing bowl contain the dry ingredients. Gently mix together until just combined. Divide batter to the prepared muffin pan. Sprinkle each with a handful of pumpkin seeds. Bake for 20-25 minuites until golden and tester comes out clean. Makes one dozen muffins.